Recent release “A Right and Wrong Way to Die” from Page Publishing author Thomas Alston is the author’s response to a personal message he received from Jesus about the needless and horrific killings and ultimately the way people die in the world today. Alston strives to inform the reader and ensure they are prepared to die and to die “correctly” when the time comes so the Kingdom of Heaven can be entered. Thomas Alston, a deeply spiritual author, husband, son and father of three, has completed his new book “A Right and Wrong Way to Die: a gripping and potent primer that prepares readers for the Kingdom of Heaven through a personal message the author received from Jesus. Published by New York City-based Page Publishing, Alston’s inspiring tale will instill a sense of peace and tranquility in readers as they learn the author’s secrets to living each day righteously and without fear of death. 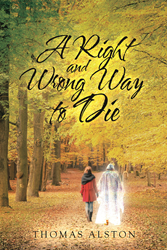 Readers who wish to experience this mesmerizing work can purchase “A Right and Wrong Way to Die” at bookstores everywhere, or online at the Apple iTunes store, Amazon, Google Play or Barnes and Noble.